African American women, are complex, lovely human beings that demand respect with every step they take in life. I was looking over pictures in my family's photo album and the transformation of black women from decade to decade amazes me tremendously because, in the midst of their change, they improved their lives through education, hard work, and strong values. Today, there are numerous issues that make black women cry: the loss of children, break down in marriages, cheating, and economic struggles. 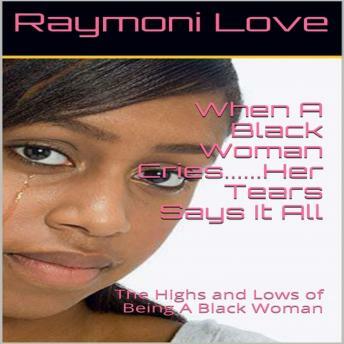 Black women cry because sometimes love or society impel them to make choices that deprecate their self-worth, health, and parental skills, which is consequential to the development and success of all black people. Black women must continue to cry because if black women stop crying and let anger force their hand, love would become recalcitrant to sensitive touches, children would become motherless, and the streets would have new members on the edge ready to destroy the soul of America and black men. So cry, black women - let your tears soak new meaning to the soil of this life, which will grow new flowers that will enlighten minds, so love and not violence or disrespect would rule the ground that produces loving black families. The #METOO movement significantly brings attention to women being sexually harassed and mistreated, and no woman has been more mistreated and harassed than a black woman.